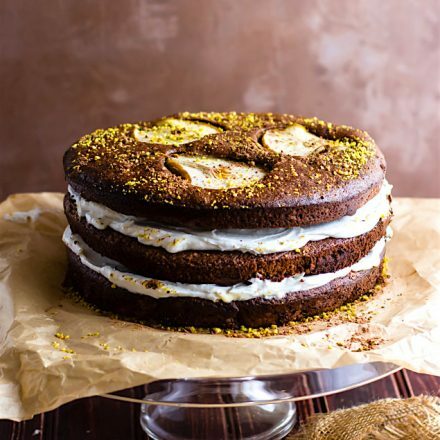 Flourless Chocolate Pistachio Pear Naked Layer Cake. A paleo flourless chocolate layered cake that is light in texture, rich in taste, and delicious! 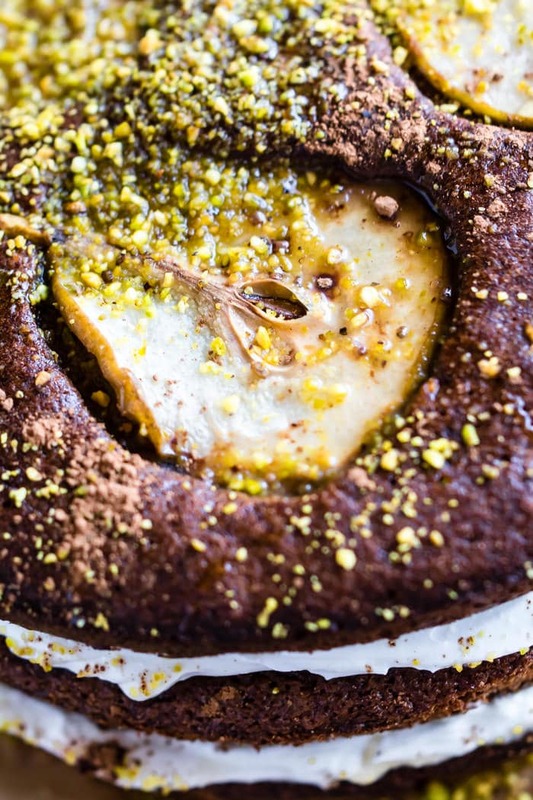 Filled with maple coconut cream then topped with cocoa, glazed pears, and pistachio! This naked cake is simple to make. A decadent dessert that feeds a crowd! Celebrate with cake, always! 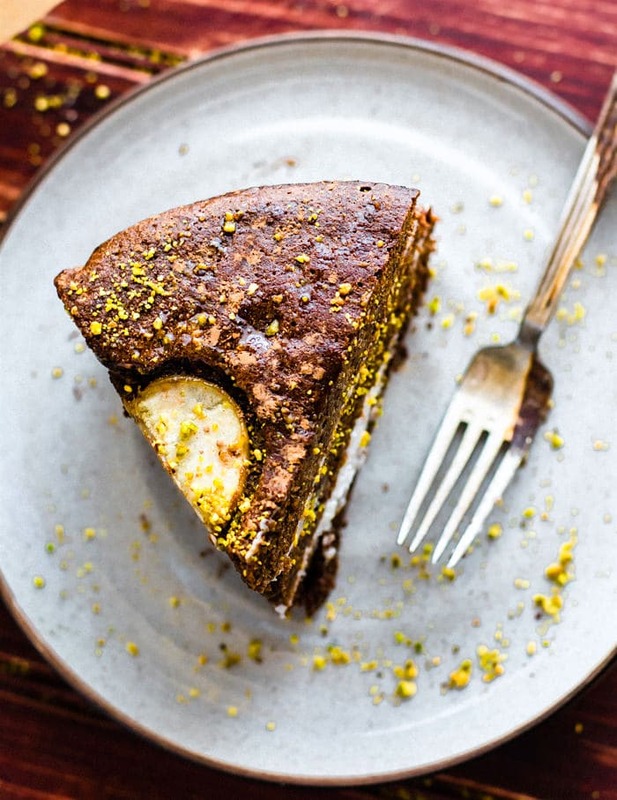 Consider this Flourless Chocolate Pistachio Pear Naked Layer Cake my official “humble pie”….err cake? I mean it is naked so it makes sense, right? Okay I may have taken that a little too far on a Monday. But you see, I am feeling quite humbled these days post surgery (update on that below). Like for reals! I’m eating my Naked Flourless Chocolate Pistachio HUMBLE Cake slowly but surely. You better believe that! Haha. As long as we are on the topic of humility, I should tell you, I am not the greatest at making flourless chocolate cakes. I tend to over cook and then end up being super dry. Flourless cookies on the other hand? Well, that I can master! Mwahahaha! That being said, a few weeks ago, I felt like we needed to celebrate a few things in life (like new HEALTH INSURANCE) and flourless cake came to my mind. Then I figured, what the heck, let’s go big or go home. Let’s make it triple layered, let’s make it sweet and salty, let’s make it EPIC and trendy! Or at least try to. Hence the naked cake part. So I planned a whole weekend to test the flourless cake part by itself. You know, so they would be be dry or break apart. Then I tested out using a pistachio meal to replace part of the flourless part, and for pretty factors. Yep, always pretty factors. Plus I adore PISTACHIO and chocolate together! SO good. 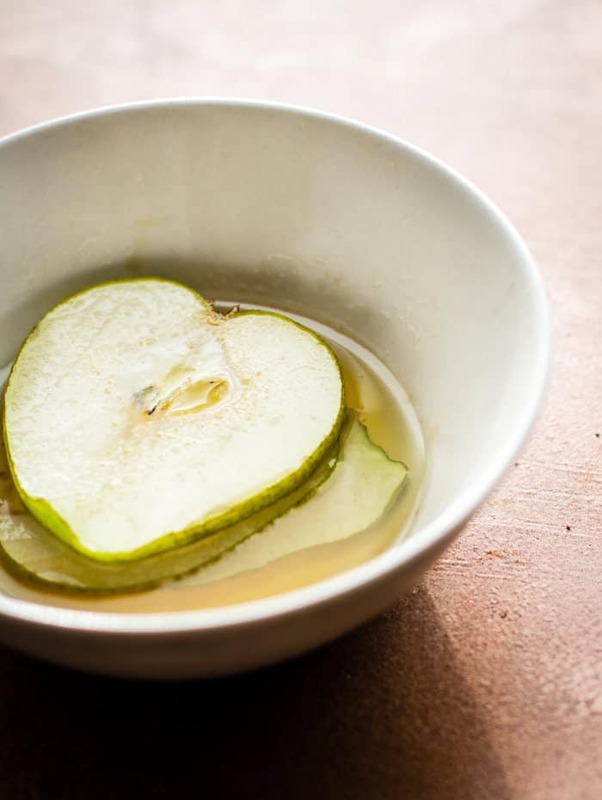 Then I tested out soaking the pears in maple syrup. Okay I really didn’t have to test that out but why the heck not. After the glazed maple pear testing, soaking, whatever… I remade my coconut whipped cream recipe. This time adding in a little maple extract and syrup. Gah… what got into me? It was like I was Martha on crack! After all the testing…. it was time. Time to put it all together in one day and SHOOT the recipe. At this point I was just sweating bullets that it wouldn’t fall over. And pretty sure I was low on blood sugar just waiting to eat this cake. Side note: If you follow me on snapchat, you will remember this day and that I totally ate the cake for lunch and probably dinner. My husband did not complain. Phew! Okay back to the humbling chocolate flourless cake story. So there I was, layering the cake. Adjusting the frosting. placing the pears exactly where they should be. Then trying to do all the fancy schmancy action shots with the pistachio crumbles. Lord have mercy! This is the best I could do. Don’t judge. 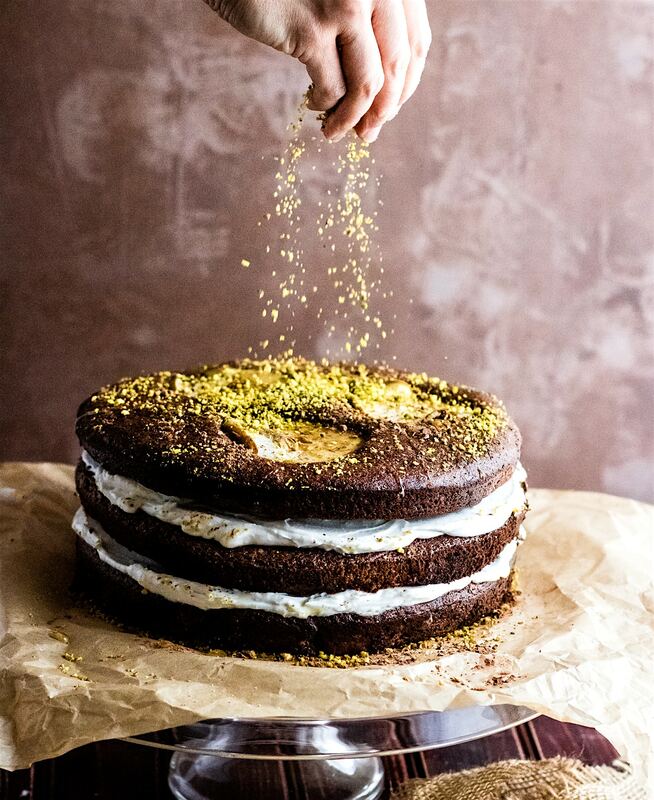 All this to say, this Flourless Chocolate Pistachio Pear Naked Layer Cake is now my new favorite CAKE with a hefty dose of important life lesson topping! This flourless chocolate cake taught me that you always need to start things over from scratch to relearn the original process. Ahem, much like health. This flourless chocolate cake taught there’s no cheating in life, just small steps forward and with a ton of patience I might add. 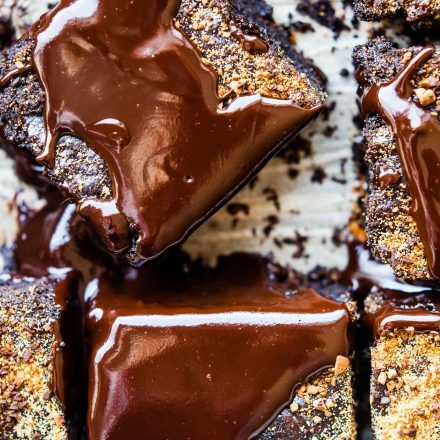 This flourless chocolate cake taught me that life is full of layers. If you have a good bottom foundation, then you can build up those layers. Layers are built up of a components that work together as a team. Together, they help you stand tall (Not falling). This flourless chocolate cake taught me that just because something looks hard and daunting, we shouldn’t fear it. In fact, we should tackle it with CONFIDENCE and positivity. Nutrition varies per slice and how much icing you fill up on. 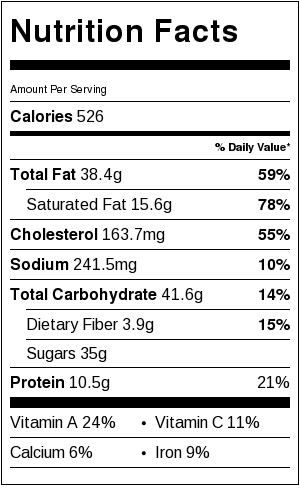 This is nutrition for a LARGER slice. Heck, just make it a meal! You are allowed Dessert for dinner! Either way, it’s good so I say this is a real TREAT for you! Enjoy and save this for celebrations or holidays or whenever. 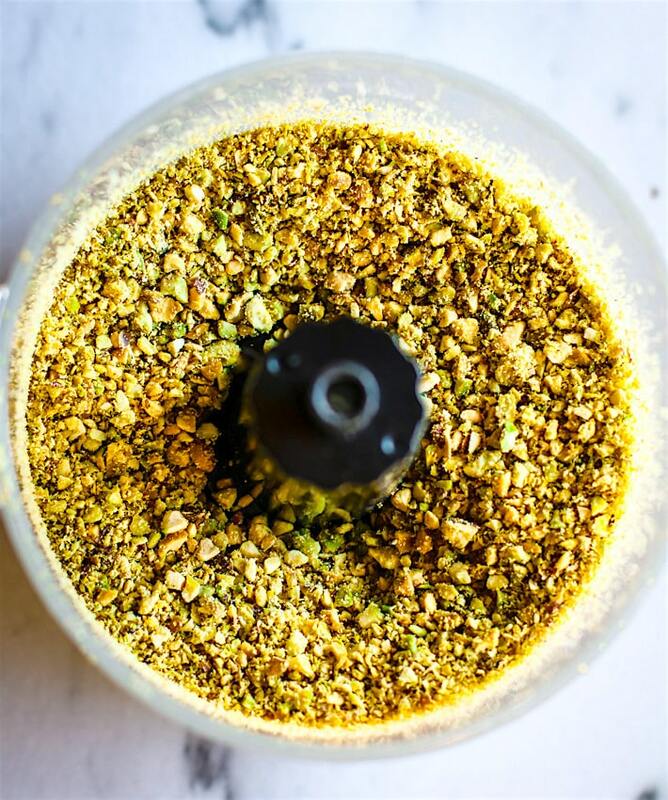 1/3 cup ground pistachio (meal) – Simply grind up 8 oz of whole pistachio to use within each cake and for topping. Next, melt butter and chocolate together over stove or in microwave. 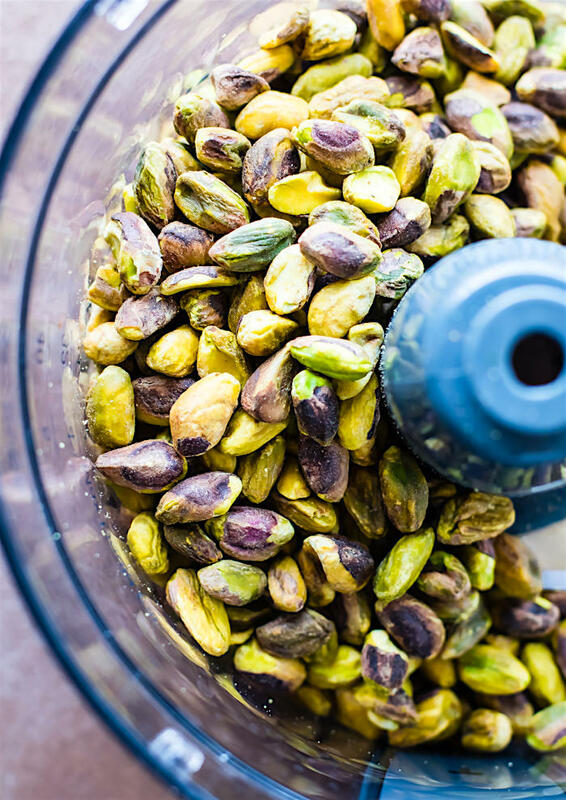 In another bowl whisk your egg yolks, almond flour, sugar, salt, baking soda, and 1/3 cup ground pistachio. Fold in your chocolate and butter mix. Set aside. Place your egg whites and vanilla in a stand mixer or mix gently with a hand mixer until soft peaks are formed. Fold your egg white (in two batches) into your chocolate, pistachio, almond mix. Do not overmix. Pour into one cake pan lined with parchment paper. Noted Place a few pieces of the maple soaked pear slices on top of one or two of the cakes. Place all cake in oven (or one at a time) slightly covered. Bake 350F for 36-40 minutes depending on your oven. Check cakes after 35 minutes to see the progress. Cakes should be clean in center when you place a knife or toothpick in middle. Once baked, remove from oven and let cool. While cakes are cooling, you can prepare the coconut maple whipped cream. Simply follow my coconut cream frosting using maple syrup versus coconut sugar. You just need to place a can of coconut cream in fridge for 24 hours until harden. Remove water when you open the can from the the fridge. Place the remaining cream contents in mixer. Add maple syrup, vanilla, and whip until fluffy. Now to layer the cake. Remove parchment paper from each. These flourless cakes are more flat once cooked, so I did not cut off top before adding whip cream, but feel free to do so before adding the whipped cream. Add about 1/2 cup or more whipped cream between each cake and stack the cakes gently on top of each other. 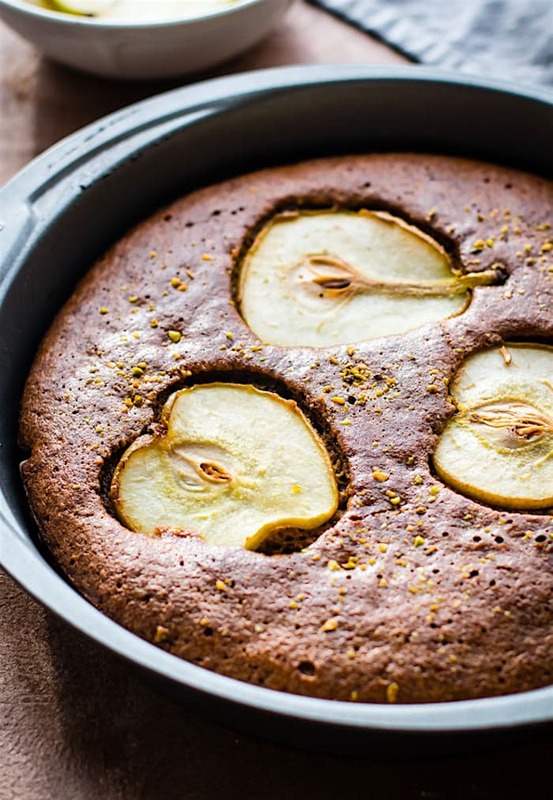 Make sure the cake with the maple pear slices are on top. See pictures above. 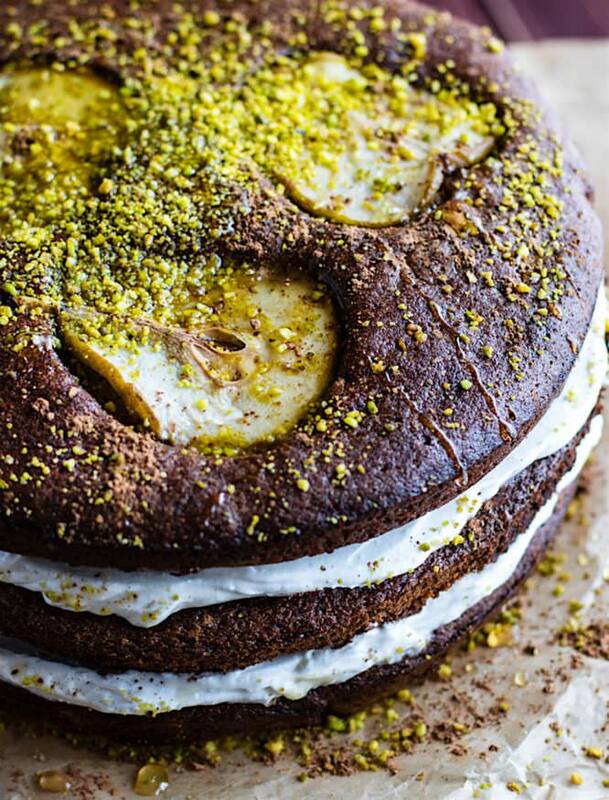 Once stacked, sprinkle with crushed pistachio, cocoa powder., and drizzle with maple syrup. If keeping for later, cover and keep in fridge. This cake will freeze for 3-4 weeks in foil. If you don’t want to wait for the the coconut whipped cream to harden overnight, you can use So Delicious Brand coconut whipped cream. Or simply replace the coconut cream with 16 oz of COLD heavy whipping cream. Heavy whipping cream doesn’t need to be chilled overnight. It just needs to be COLD. 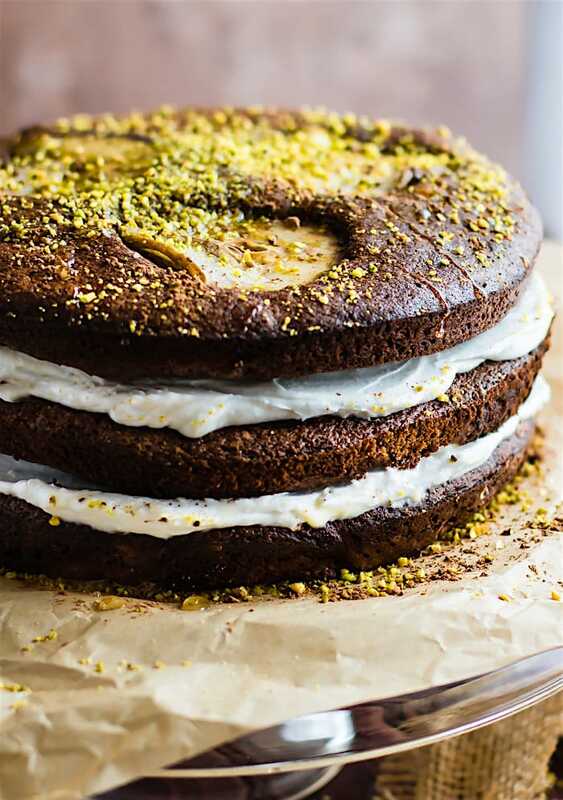 Kitchen Tools to make this Flourless Chocolate Pistachio Pear Naked Layer Cake. 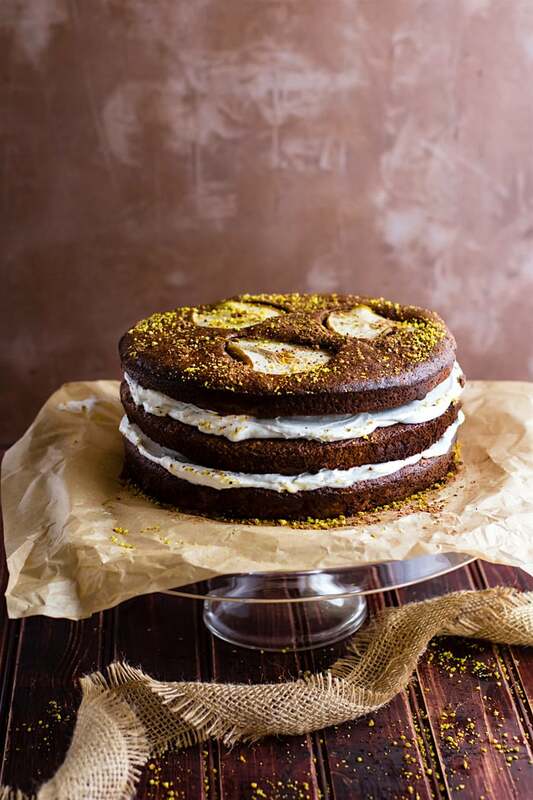 Do you like how I just made this Flourless Chocolate Pistachio Pear Naked Layer Cake one big food for thought? Well, sometimes baking does that to me. Regardless, the cake alone is actually SUPER easy and fun to make. I did the hard testing for you. Why? So that you can enjoy the process of making it yourself (with ease) and then sharing (celebrating) it with others. That’s a must! mmm k? Now that you know all about my humbling naked cake….. how about some real humbling news. My reconstructive colon surgery went well. I had it last Tuesday. The hardest part about this recovery is learning how to get the colon to “function” again. Oh boy. It’s been reshaped, resized, and all! The good news is that my gut (inside the colon) is very healthy and blood work is normal. Must be all the probiotic and prebiotic rich foods. Oh and kombucha! Yes! It’s humbling to ask for help. But also so amazing to have help! It’s humbling to teach my body (and brain) a new normal. But one that is healthy in the long run. It’s humbling, like any major change life is. But all is well and I’m so thankful to have such amazing support. So… eat the cake and eat even more for me. While you’re at it, someone please drink some wine for me too, mmmm k? 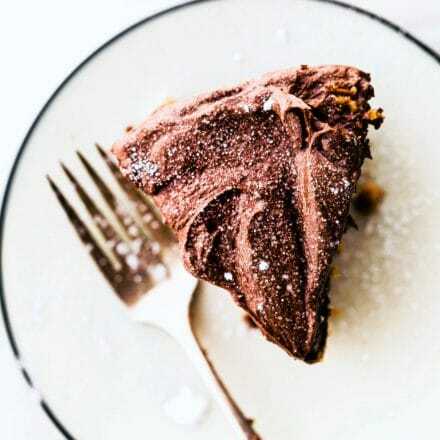 Chocolate Flourless cake and wine –> DO IT! Who’s up for another 3 tier cake? I’m getting the hang of this. I’m SO relieved to read that all went well with surgery – wishing you a full recovery and lots of rest xo And of course this cake is beyond gorgeous. Sending you so much love. I didn’t get your email, so try again at suzlyfe@gmail. I hope you are ok! What a beautiful cake friend! Glad to hear you’re on the mends and everything went well! Thank you! When is your surgery? Your 9 ingredient layers look fantabulous, Lindsay! And those action shots with the pistachio crumbles are super “fancy schmancy” – Yay for new health insurance and you getting better! im so happy to hear about your surgery..send you hugs! this is so beautiful and taste delightful. I’m so ready for fall and all of its delicious flavors. This is calling my name! WOW you are quite the baker! 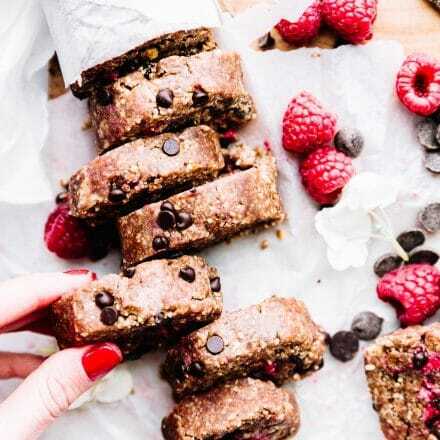 You can do it all Crazy Cotter…AMAZING and this looks DELISH! Did you know flourless chocolate cake is my favorite dessert ever in life? Yet another reason we’re brothers. Oh man this cake looks amazing. I need this in my life right away. OMG These cakes are perfection. Goodness gracious, this is stunning. I’m so glad you’re on the mend and the surgery went well! You’re such a strong, talented lady and I’m happy you were able to get the surgery and take care of you ? You are too kind. Thanks Ellen! Hooray for celebrations and hooray for a seriously impressive looking cake! I am so happy for you finally being able to have the surgery done and I hope it makes a world of difference for you as you totally deserve it! bee-u-ti-ful! I’d totally have that for lunch! And, pistachio meal, lots of iron! i brought a bunch to the gym! haha, next time! Omg Omg Omg Lindsay ! Did you update your photography gear, the first photo looks so amazing, it’s perfectly real! Ya because some cakes I see on Instagram are extravaganza! Now philosophy of life within cake making? love this so much, you really can be a couch! With everyday life jobs, chores, people forget how small thing teach us important lessons, really I’m speechless! What a GORGEOUS cake Lindsay! I’m happy to hear you are on the up and up and know that I am sending love and positive healing vibes your way. You did have a lot to celebrate and it sounds like you learned a lot too! thank you so much Ellie! that means a lot. 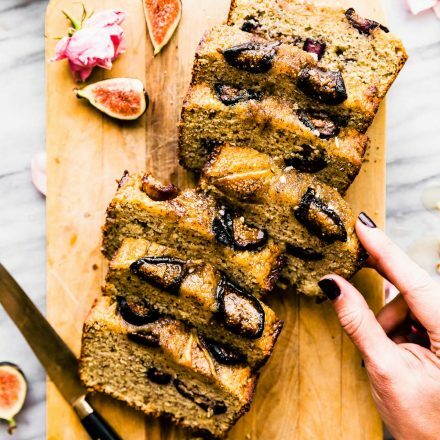 I love how much cooking and baking can teach us; this cake looks like the BEST breakfast, lunch, dinner or even dessert! it’s totally allowed. I really did have this for lunch haha! I’m glad that you’re on the mend, friend! Sending tonnes of positive vibes your way <3 And I'd happily eat this cake for breakfast, lunch, and dinner. It's SO gorgeous! thank you friend! <3 you so. Life lessons through a flourless chocolate cake. I love it and the pistachio chocolate combo. I’m so glad the surgery went well and you’re adjusting to your new normal. This cake looks DIVINE! I love the delicious pears on top of the first layer! This cake is SOOOOOOOO good, everything a cake should be, it truly is the perfect cake, beautiful, simple, not too sweet but so rich, and it was a celebration, it felt like a special occasion for the last few days. Hi. I’m really keen on making this cake. It looks beautiful. 1) Could I just triple the ingredients in one large bowl and then separate into 3 cake moulds instead of doing seperately? 2) Could I reduce the number of eggs per tier – maybe 2-3, or would this impact the way the cake turns out? Perhaps I could use 2 eggs and 1 tsp of baking powder instead? Okay that was 3 questions…sorry! You could try baking it all in one batch. It didn’t hold as well when I did but i think it can still work, just adjust the eggs a bit. Maybe add more baking powder? Definitely try and keep me posted! Thanks so much! I will try it and definitely let you know how it works out.